We spent the night in Salt Lake City then drove up through Idaho up to Montana. It didn't look to far on the map when looking in the UK, but it really was a long 5 hour drive. Distances in this part of the US are just on a different scale. 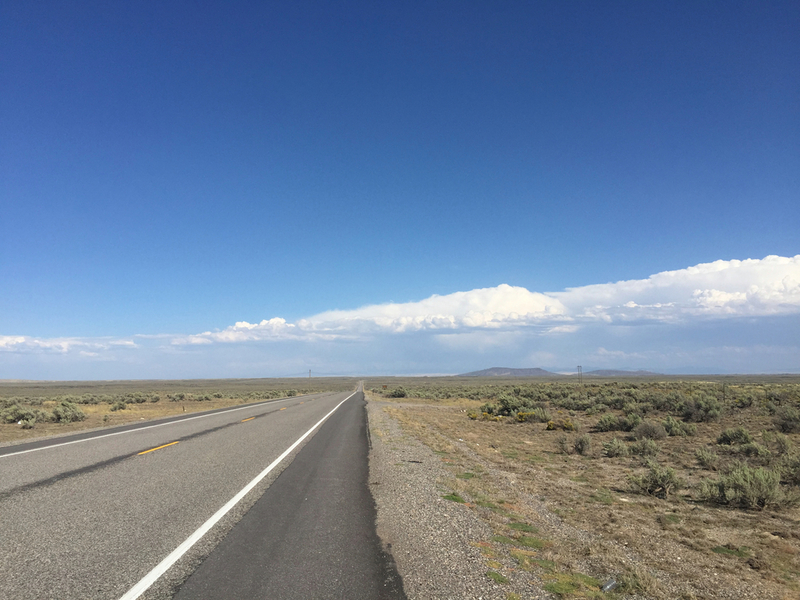 In addition to big sky scenery (like below) we also drove through HUGE lave fields in Idaho - I got a bit excited! Finally we arrived at Yellowstone under canvass. The next day we spotted our first Bison within an hour of entering the park! Then we arrived at the first hydrothermal area on our route. It's a really weird landscape, with trees killed off by the heat/chemicals in the water. 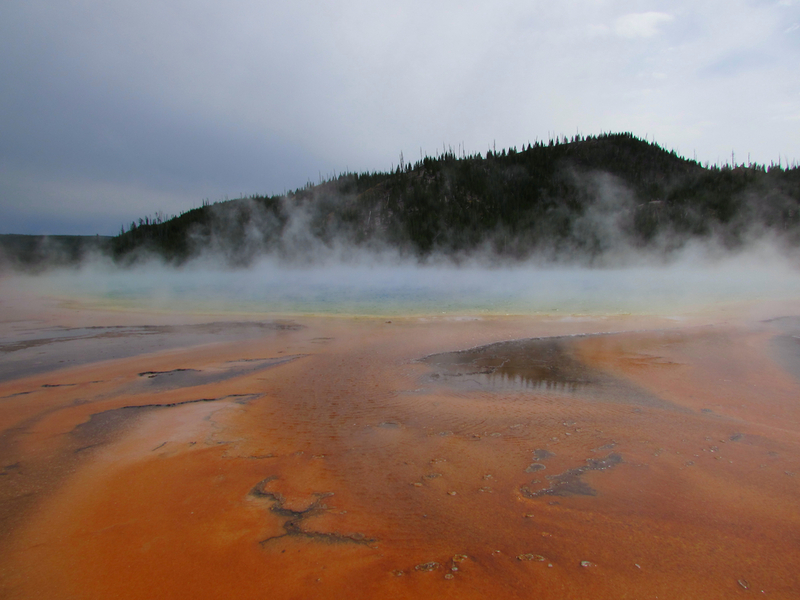 The orange stuff is algal mats, these extremophiles have evolved to thrive in the hot water. And a Geiser!!!! Some of these only erupt occasionally and dramatically, this one was going pretty much continuously. After lunch we went to see old faithful, it erupts every couple of hours or so and the water shoots up to 30ft. Because of it's fame you kind of have to see it, but really it was my least favourite place in the entire park. There were loads of people crowded into a kind of amphitheatre, with a large hotel/lodge and in the end the eruption of water was pretty underwhelming. At our next stop there is a famously colourful and very large hot pool. Climbing up to the pool you could see the excess water joining the river system before making it's steady way to the Pacific. 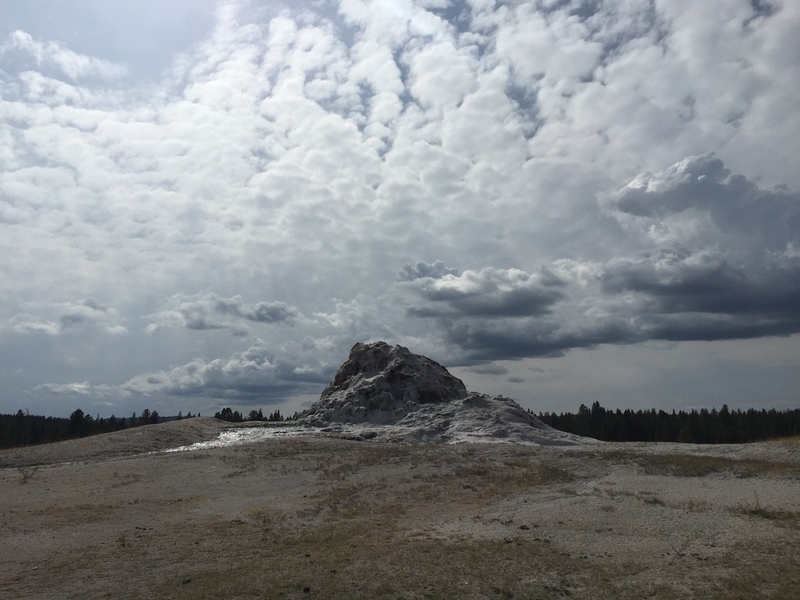 You're very rarely alone in Yellowstone, and we were there out of season. We found this pool just by the side of a road. There is so much hydrothermal activity in this park (they say more than anywhere else on earth) that you can come across a hot pool like this and the only notification is a "danger hot water" sign - in any other country it would be a major tourist attraction. 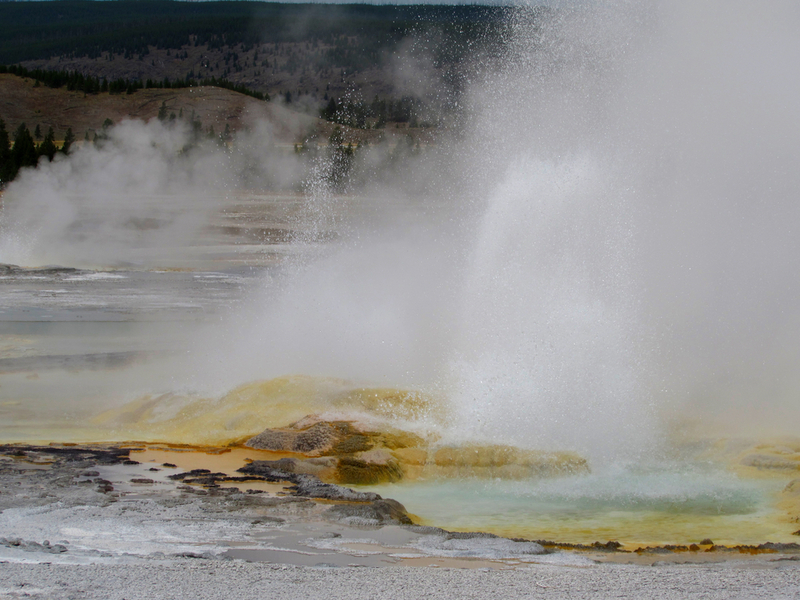 A more rarely erupting Geyser, it did not blow while we were there. 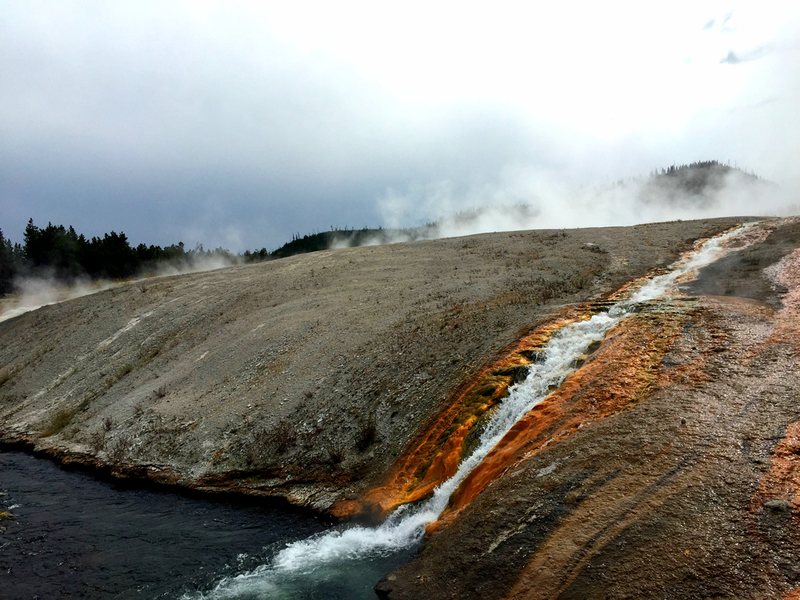 The reason for all this hydrothermal activity is that Yellowstone is located on top of a super volcano. It has not erupted for several thousand years, which is a good thing, since were it to do so it would blanket half of the US in a thick layer of ash and probably cool global climate for several years. In the photo below you can see the outer wall of the enormous caldera. We thought this was a moose originally but were later informed it was an Elk. Looking from the UK Yellowstone looks big but manageable, so we set ourselves up to stay in one side of the park and just drive round each day to the various sites. In hindsight this was a mistake, the park is immense (8,900 square km) equivalent to the Lake district, the Cairngorms and Snowdonia combined but with only five roads in and two roads shaped like a figure 8 (the north and south loops) running through the middle. We found out that a popular way of visiting the park is to book a night at each of the entrance points to the park and see all the sites on the way to the next hotel - we would definitely do that next time. We were based by the West entrance. On the first day we did the western half of the south loop. On day two we did the whole of the North loop!!! in all that was around 4-5 hours of driving. The water coming out of the ground is not only hot but mineral rich. At Mammoth hot springs calcium carbonate is deposited gradually in these step like formations. On our third day we did the middle section of the 8 and down part of the western part of the south loop. We had a close encounter with a Bison, they are REALLY big. For me, Yellowstone had always been about the volcanic activity. The hydrothermal activity definitely lived up to expectations but we also got incredible scenery which I'd not been really aware of before going. Here you can see the river carving through rhyolite deposits with a thin band of lava very near the top. 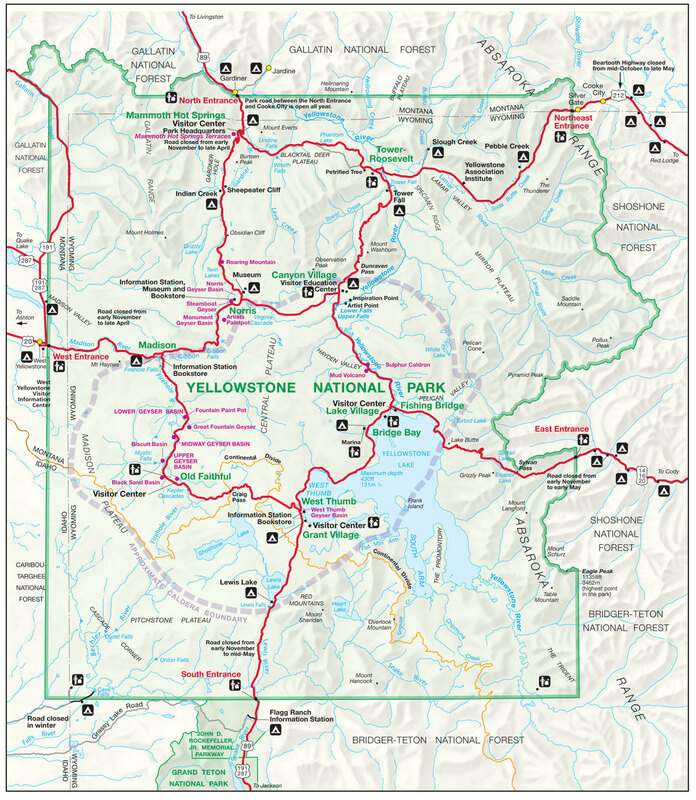 The grand canyon of the yellowstone - The yellow rhyolite is likely where the park got it's name. Looking back the other way down the grand canyon. The waterfall sits on a layer of tougher basalt. Juvenile Osprey preparing for it's maiden flight. We tried to make it down to the main lake but the road was closed off. 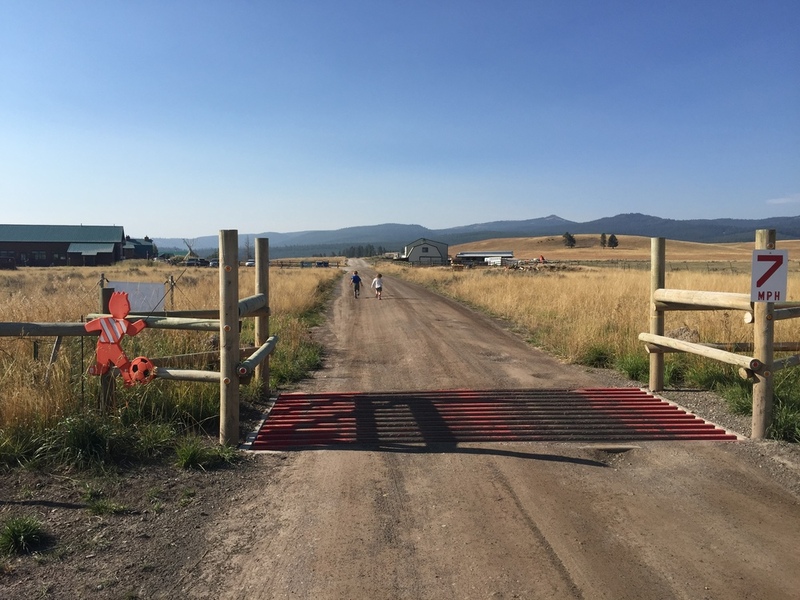 With no way through we turned around and were promptly caught in a Bison induced traffic jam. An entire heard decided to use the road so everyone stopped while they lumbered their way along. With a mixture of everyone (including ourselves) taking photos and the bison being in no hurry we were stuck for a good hour. Apparently in season these traffic jams can last a lot longer. After a while in Yellowstone, steam coming out of the ground at random points along the road seems pretty normal. Looking back on it, it's extraordinary. I would really recommend Yellowstone Under Canvass to anyone visiting, it was really well set out and we met some really nice people by the fire pit in the evenings. Yellowstone was by far my favourite place on the US part of this trip.